Self-driving cars are coming: will you even need a licence? 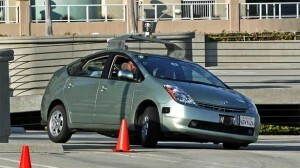 Home › Car › Self-driving cars are coming: will you even need a licence? Self-driving, driverless or autonomous cars are going to change your life in ways you can’t even imagine. We’re entering an era where many people will choose to predominantly be a passenger in their own cars rather than have the pleasure of driving. That’s because many times we drive, we actually have displeasure; rush hour, heavy fog, driving rain and other challenging driving situations are a far cry from a sinuous piece of blacktop up the side of a mountain. It may be that you can get in a car without a licence and it will take you where you want to go, but not allow you control. Or, you can get in the same car and present a licence and the car allows you to take control whenever you want to. For the next few years (perhaps a couple of decades) you will need a licence, but let’s explore just what could happen as our vehicle fleet is gradually displaced by autonomous (self-driving) vehicles. Around the world we build more roads for ever more vehicles, but that will change. There is a huge push for rail transport to make a comeback, but that is based on technology that is a couple of hundred years old, and it’s not convenient. In fact, all modes of transport we use are over a century old. The first commercial passenger flight was on 1 January 1914. 1886 is generally given as the year that the first modern automobile was created. Buses predate that if you include horse-drawn buses which appeared in 1827. Trains came earlier still with the first proper railway being constructed in 1819. High-speed trains have their place. Airplanes are unsurpassed for long distance travel. Buses and cars, though, along with trucks, are on the cusp of a revolution. Our first thoughts about self-driving cars are that you might go to your car parked in your garage, enter in some coordinates into the satellite navigation and let it take you there, kind of like an invisible chauffeur. You can read a book, send an SMS, update your Facebook status or have a nap while your car takes you to the right destination. There are already cars that will drive for you on certain types of roads, but you still need to be ready to take control. For example, some new Fords and Hondas have systems that will keep you in a lane on a motorway by monitoring where you are in relation to the white lines, and they will adjust your speed using radar cruise control. But they can’t deal with junctions, roundabouts, and other general driving duties. Purchasing an owning an autonomous vehicle is an interim possibility because once this technology becomes efficient and cheap, it will change the very model of car ownership. Autonomous cars already exist. Honda, Cadillac and Mercedes have both demonstrated cars that will navigate their way out of a crowded city, interpreting road signs and traffic lights, avoiding pedestrians, and ultimately driving at highway speeds on twisting country lanes. What’s this going to mean? Car crashes, and their related injuries and fatalities will decline dramatically. An autonomous car won’t be as safe as an average driver because an average driver isn’t safe: it will be many times safer because it can monitor multiple angles at the same time, and calculate distances and trajectories accurately. It will be able to apply instant evasive or corrective action should a situation occur. Car deaths will eventually become as rare as those related to rail or airline travel because, combined with the autonomous driving, vehicle crash protection standards continue to improve. It may even be possible that cars will have rear-facing seats which are safer in accidents, although some kind of opaque windows will be required for those that get travel sick. Humans are not as good as computers at driving efficiently. We brake late, accelerate too hard, don’t anticipate the road ahead and generally drive cars that are too big for our requirements most of the time. If you have your own driverless car, then the fourth reason won’t change, but if we imagine a fleet of autonomous vehicles and you book the most appropriate one for your requirements at the time you might elect to get a light, single-seat car to commute into work whereby the fuel economy could be immensely greater than the SUV you’d book for the weekend to take the family to pick up some bulky groceries. Driverless cars are likely to be hybrid diesels for longer trips or full electric for shorter trips and therefore will be ridiculously frugal. When you factor in your total costs of car ownership, renting a vehicle when you need it could work out much cheaper. Autonomous cars will be able to travel faster and much closer together without risk of accident and will be an appropriate size for the type of journey being taken. This means that single-seat, small driverless cars could even travel side-by-side in the same lane, increasing the number of cars that can pass a given point. Humans cause traffic jams through quite minor events – panic braking, lane changes, inefficient merging and other poor driving skills. There are various theories about why traffic jams form, such as the three-phase traffic theory. Take humans out of the equation and the total volume of vehicles a road can carry will increase dramatically, especially if vehicles can communicate their intentions to each other. We’ve already mentioned that self-driving cars can travel closer together and faster, and that means average speeds will be able to increase, shortening journey times and improving our quality of life. This may also have an effect on the value of city centre property versus that in the suburbs if part of a property’s value is related to commute time (although, it will all be relative, and there are other factors at play here such as telecommuting). Technically autonomous cars could travel safely together at 100mph/160kph, but other factors come into play such as increased fuel consumption and the risk of hitting large wild animals such as deer – something that a driverless car might be unable to completely avoid even with thermal imaging and perfect reflexes. If average road speeds increase, flights under two hours will actually take longer than driving in many cases. By the time you are driven to the airport, check your bags, wait for the plane, board, taxi, take off, fly, land, disembark, wait for your baggage and drive to your destination, you could have probably arrived in comfort in your car. Airlines have cramped seats whereas in a driverless car you could sit in the passenger seat and sleep, work, eat or indulge in a movie. If there are several passengers you would treat your car like you would travel in a train and would be able to play games, for example. Regional airlines and small airports may eventually be forced to close, unless there is an upsurge in personal aerial vehicles such as jetpacks and small planes where aviation authorities might mandate specific take-off and landing zones. …and that model will be one that is stupendously cheap. Subways in major cities like London will probably survive due to the sheer number of people they can move and the population density of the areas they service. Travel out to the suburbs and in the suburbs, though, will be far more convenient in cars. With the improvements in fuel economy plus driverless cars, prices may not be significantly more than taking a bus. If more children end up travelling alone, dedicated service centres with safe areas for kids may emerge. For example, every 1-2 hours on a motorway so that a child can stop off for the toilet or something to eat or drink. When buying a car most people get the best they can afford. This usually means they pay more than they should. People will now rent a car that suits their needs at the time. Many people drive into the city, pay to park their car all day on expensive real estate then drive it home. A self-driving car that you own could be sent back home (if that was more economical), although that wouldn’t reduce traffic congestion. However, if you had booked a ride into work in a hired driverless car, your car could be used to pick someone else up after it has dropped you off, or even pick up multiple people on the way to the same locale in a car-pooling/car-sharing scenario. In either scenario there may be less car parking spaces required both in parking buildings and parking spaces on city streets. This would result in more road space being freed up to use as lanes for cars. Whole stretches of road that are currently designated as parking areas could become additional lanes for autonomous cars to speed up their movements. Houses won’t need garages if a car can be summoned when required. The two- or three-car garage might be replaced with a single-car garage whereby one car is owned and a second is rented as needed. The spare garage space can be converted into another internal room (subject to council approval). With less parking required, new suburbs might be built with narrower roads and more pedestrian-friendly areas. This will maximise the land’s value and usage as a significant portion of any housing subdivision is taken up with roads and driveways. Newer cars will also be quieter and safer and this might drive homeowners to seek houses with smaller front gardens that are easier to care for seeing as distance from the road won’t be such a factor in reducing noise. We already see in some high density cities, such as Tokyo, that young people are not bothering to get a driving licence because public transport is convenient enough, real estate is so expensive that many people don’t have garages, and sometimes you must prove you have a parking space before you are allowed a car. This trend will accelerate when there is no actual need to own a car. Where land is expensive, cars will be seen as a luxury. Why take up that space letting your car sit there? Because autonomous cars don’t need a driver like a taxi does, renting them will be very cheap. An autonomous car will have systems to detect exactly what is required to be done in terms of maintenance and repairs. It will be able to drive itself to an approved service centre. In the case of fleets of cars run by companies, maintenance will benefit from economies of scale in larger service centres, like bus and taxi companies use now. There will still be mechanics who work on older cars, collector cars and specialist vehicles such as agricultural machinery, but the backstreet mechanics will decline. Panel beaters and spray painters will also decline in number as there will be fewer accidents. Tyre fitters will have less business because the efficient driving employed by autonomous vehicles will be easier on all the vehicles’ parts. The profession of ‘driver’ may disappear completely once the technology is available for vans and trucks. Only loaders and supervisors will be needed. Taxi drivers will become redundant as you will book your car using your credit card, it will require ID before it lets you in, and it will drop you off safely at your required destination regardless of how drunk you are. Of course, there will still be racing drivers – just like we’ve predominantly abandoned the horse as a mode of transport, there are still jockeys that race horses. There will be a greater need for cleaners and for people to deal with lost property, and perhaps customer support to deal with booking problems (though most of this will be done online). Courier drivers will no longer need to drive – just to load and unload. Insurers in some countries already offer discounts if your car comes with automatic braking systems such as Volvo’s City Safety. Faced with less payouts for both vehicle and personal damage, and less administration because of this, insurance should become cheaper for those who have cars with active safety features (as long as they’re not overridden). If you are hiring an autonomous vehicle, insurance will be part of the hiring fee and there will be no difference in the price regardless of your age. Perishable items can be picked and sent by autonomous car to your doorstep almost on-demand. Bulky items could be loaded into special courier vans which either have a person on-board to unload when it gets to you, or that you unload. Pizzas and takeaways will be delivered to your door using small efficient vehicles that will automatically dispense your food when you scan your ID or enter a code. The ability for vehicles to drive children to school without adult supervision will take longer to accept. Schools will almost certainly require an adult to be present on the bus to diffuse any situations that might occur when children are left unsupervised. Even though we’ve covered a huge number of benefits, there will be problems. Because driverless cars will be far more fuel-efficient, governments won’t be able to collect as much fuel tax, therefore fuel prices may increase as governments seek to balance budgets on road maintenance. Autonomous vehicles will be less wearing on the road, but this is unlikely to offset the drop in fuel tax income. It will mean that there will be less roadworks, though. Less roadworks means less people required to work on the roads and therefore there may be some redundancies. There will need to be monitoring within the cars for cleanliness, especially if the cars are booked consecutively without returning to a base. Driverless cars will need some kind of verified ID entry and perhaps a larger refundable deposit in case of damage through vandalism or inadvertently scratching or tearing something in the car. Systems that control where the vehicles go and how they react to situations will need to be robust, but won’t be initially because new scenarios appear every day. For example, can the vehicle cope with hitting a patch of black ice, looking for standing water that might cause aquaplaning, freak weather conditions such as tornadoes, recognising and dealing with a puncture or breakdown, etc. Mapping services struggle to keep up with the sheer number of new roads created, and changes to existing road networks which means that a destination might be unknown, or the car may try to navigate down a street that has, that morning, been closed off. Autonomous delivery vehicles that are on the road all day will need an automated filling method or they will need to return to base. Systems will need to be in place to eliminate the potential for fraud. Bookings will be conducted primarily online. Spikes in demand may cause server outages, and if there is an interruption in internet access people can’t book vehicles. Vehicles will also need to be in constant communication with the central server for weather and traffic information, navigation and bookings. If communication fails for any length of time, passengers might be stranded. There is the very real possibility that cars can be hacked and used for criminal activity, or driven into crowds of people or building to create death and destruction. Companies will want to amortise their investment in driverless technology and therefore the first wave of autonomous vehicles are likely to be expensive. So, will you need a driving licence? In the future cars, motorbikes, vans and trucks that you drive yourself will be a curiosity just like vintage cars are now. They will be owned and driven by enthusiasts who are prepared to weather the higher costs associated with vehicle ownership. People may even come to view cars as we see them today as an inconvenience – something you have to manhandle down the road; something that requires your attention all the time. You won’t need a driving licence, but don’t give up just yet. This scenario will play out over a very long period of time. If you live or travel rurally it might not be for several decades or longer, so it’s best you learn to drive. 6 Pings/Trackbacks for "Self-driving cars are coming: will you even need a licence?"